Kingston Kaiser Chrome Single Handle Bathroom Faucet w push Drain FS8431DKL: This Single Handle Lavatory Faucet with Push-up Drain is built to last. The highest quality standards are used to precision manufacturer a top of the line product. Important features of this BRAND NEW Fixture: Complete Item! Everything necessary for installation is included. 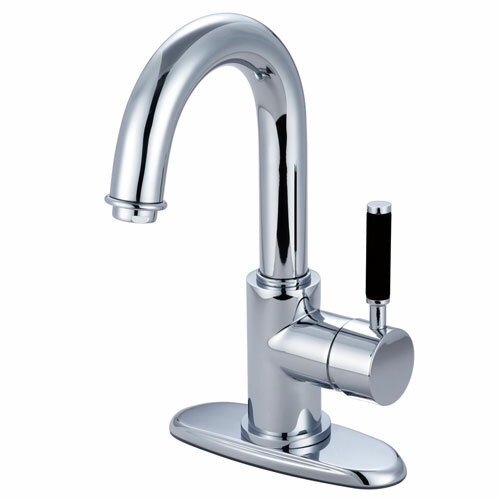 - Solid Metal Lever Handle - Matching Accessories Available - Easy to Install - Installation instructions included - Single Handle Bathroom Faucet with Push-up Drain - The single-handle lavatory faucet from Kaiser is fabricated from solid brass material for durability and reliability. Its sleek design and lustrous appeal also features a premium color finish which is resistant to tarnishing and corrosion. With its solid brass construction and smooth detail, the faucet is made to appeal but also is engineered to be drip-free, care-free and long-lasting. - High Quality Brass Construction - 2.2 GPM / 8.3 LPM at 60 PSI - 1/4 Turn Ceramic Cartridge - Black silicone handle for a great grip and easy clean-up - Chrome premier finish designed to resist fading and tarnishing. This fixture is manufactured by Kingston Brass and is part of their Kaiser collection. The single-handle lavatory faucet from Kaiser is fabricated from solid brass material for durability and reliability. Its sleek design and lustrous appeal also features a premium color finish which is resistant to tarnishing and corrosion. With its solid brass construction and smooth detail, the faucet is made to appeal but also is engineered to be drip-free, care-free and long-lasting.